Image source: York et al., 2016, Journal of Ecology and Evolution. Most of the world’s polar bears live in Canada. Hunters and elders from northern Canada’s native communities have been immersed in studying polar bear ecology for centuries. In two new peer-reviewed papers published in the journals Ecology and Evolution and Polar Record, scientists record the observations and experiences of Canada’s polar bear “experts” — the community members who live side-by-side with these “sea bears” (Ursus maritimus). According to scientists, no study has indicated that there is reason to presume that the perspectives of community observers are either suspect or incorrect. In fact, there have been multiple occasions when traditional ecological knowledge gleaned from local populations accurately identified polar bear subpopulation trends before new scientific studies could be conducted to corroborate them (York et al., 2016). The overwhelming conclusion from years of accumulated conversations with native populations about polar bears is that there is almost no connection between the long-term observations of polar bear ecology and the more recent claims that polar bears as a species are in grave danger due to climate change and thinning sea ice. 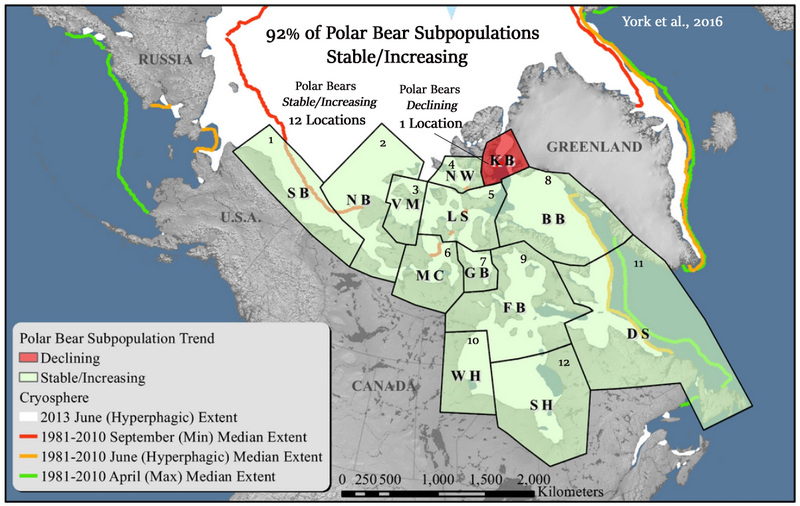 In fact, the long-term observations suggest that polar bear subpopulations are currently faring quite well, with 92% of the subpopulations studied either remaining stable or growing in recent years. According to Inuit observers, there may even be “too many” bears now. 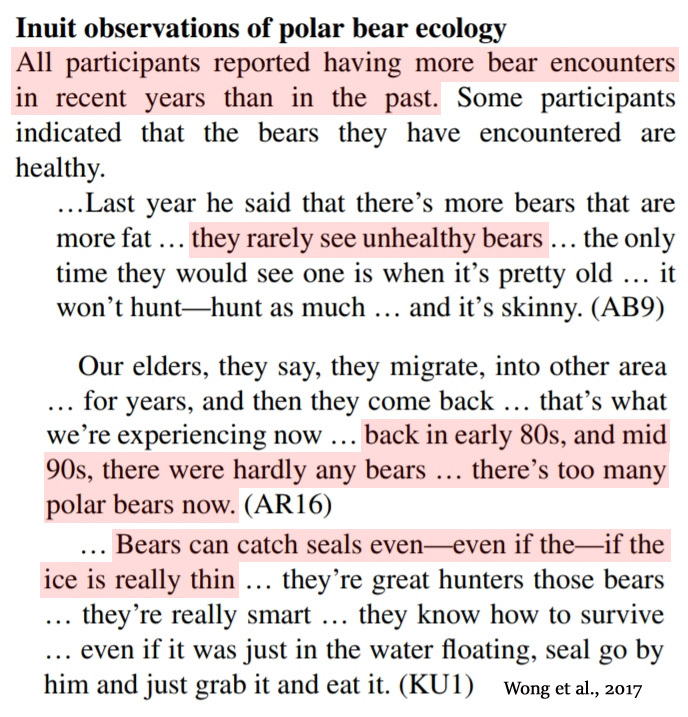 Furthermore, the traditional ecological knowledge (TEK) gleaned from local populations affirms that polar bears do not need thickened sea ice to hunt seals, as they can “catch seals even if the ice is really thin” (Wong et al., 2017). The recent observations of polar bears eating land-based food, or eating out of garbage bins, is not evidence that they are hungrier and more desperate due to climate change. According to community observers, it is quite “typical” for polar bears to forage for land-based food (and garbage), as they are opportunists when it comes to food sources. Polar bears have been consuming land-based food well before there was concern about thinning sea ice and climate change. Please forward this to Susan Crockford, and to the authors of the smear paper Harvey et al 2017. I wondered how long it would take before someone realized that with the absence of harvesting, some locations would be overpopulated by polar bears. In some locations, harvesting will have to resume to protect human life. And now that the polar bear is not an endangered species, it should not matter if their range is reduced by harvesting. The Innuit have been complaining about too many bears for at least 5 years. … claiming everything is alright with the polar bears is a false claim because they are finding fewer seals to eat and young polar bear death rate is increasing. Of course this is his usual tactic to post nonsense with no supporting evidence. Probably he will now say that I’ve lifted the quote out of context, and/or that it has nothing to do with this article, but we all know that is incorrect. Interesting quoting technique leaving out “The clip also says” at the beginning. And you really felt I should apologize to you? but we all know that is incorrect. Your behavior borders on trolling. Come on that’s not really up to your usual shouty banality. Remeber your trying to save the polar bears, the environment, the world! That reply wouldn’t save a fly! It about polar bears seb, not your ego! Where’s all your huff, hubris, and bluster gone? All you’ve offered is a very weak attempt to shoot the messenger for the essence of the message. However I note that you still have no supporting evidence for the quote I gave, just a very poorly executed distraction. All-in-all you have nothing, zero, zip — the polar bears are doing just fine. So come seb, evidence about the polar bears. “… claiming everything is alright with the polar bears is a false claim because they are finding fewer seals to eat and young polar bear death rate is increasing. or be ridiculed for it, for it is tosh and nonsense! What the hell? Is this the scientist thing all over again? What are you even talking about? My claim? Stop being so obtuse, stop thinking this is about you. I note that you still have no supporting evidence for the quote I gave, just a very poorly executed distraction. All-in-all you have nothing, zero, zip — the polar bears are doing just fine. Again, my reply is “what the hell?”. The quote you gave a clearly not my words and not my claim. It’s what the moderator in the clip said. Reading comprehension: F for failed the class! Still your desperate child-minded attention seeking antics, I see. Keep trolling, seb. Its who you are. Have you found any empirical proof that CO2 causes warming in our convective atmosphere? … or are you still the same anti-science AGW apostle you always were. Bye for now, I have far better things to do that pay your mindless attention-seeking games. This is not what the models say and the models may be right! Logic> and the models also may be wrong! The strange thing is that we have seen all this before, conducted by a fellow called Lysenko… and we as a society learned nothing from that, while some seem to have learned everything from him. Well, obviously the Inuit are unapologetically anti-science, racist, homophobe nazis. I’m sure that Sebastian, if he were a scientist, would be one of those condescending “I know best” types. It looks like this blog (‘s comment section) has become about me. So many mentions … where is sunsettommy writing that I have presented no counter argument? Where is ClimateOtter? And why is nobody asking if I think polar bears aren’t scientists? Where would we be without your proof that AGW alarmists are seriously stupid? Not any members of the AGW church, for they have a static model of the world where movement is always tagged as anomalous. Conversations with the Inuit peoples need to be homogenised to enable Michael Mann to continue to criticize Susan Crockford. Polar bears are definitely not averse to land-based food, which is why people who live in proximity to polar bears always carry a high-powered rifle when outdoors. Polar Bears exhibit clear signs of White Priveledge. Peculiar the same day of this article a picture appeared of a skinny polar bear in distress in the Dutch MSM and the text “suffering from climate change”. The blogs of AD and NOS were overrun by comments. I pointed out the reference of the scientific work by York and Wong. But the years and years of indoctrination by the greenies was difficult to turn the tables.